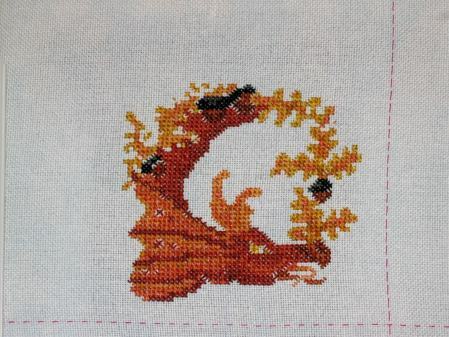 Over the past week, I have been busily stitching away on the Autumn Dragon for Christine‘s RR. Like Christine, I was not as big a fan of this one as the other two we have stitched so far. The main portion of the dragon was not too bad, but the fractional stitches with blending filament is a pain. The colors in it are fantastic. I was about a quarter of the way done with it on Friday and I made it the focus piece for this weekends Stitch-a-thon. As of this picture, I am basically done with the cross stitching. I plan on tackling the back stitch tomorrow night. In other news, today was my birthday! I am now officially in my last year of being twenty-something. Looking back, I would say it has been a very successful 29 years. It has been a nice birthday weekend, too. Last night, Allen and I went to my parents to celebrate my birthday and my sister’s (which was last Friday). Today, I got a chance to relax with Allen and we made a wonderful dinner together. I got some lovely gifts too. I got a gift certificate to Amazon, some lovely lotion, a Vera Bradley diaper bag from my sweet family member. Allen went over the top and bought me a new Ott-lite for my stitching area, which means I can take the old one (which I pilfered from Allen) and use it in my sewing room. He apparently also ordered the sewing table I wanted. I also got this fantastic gift in the mail. 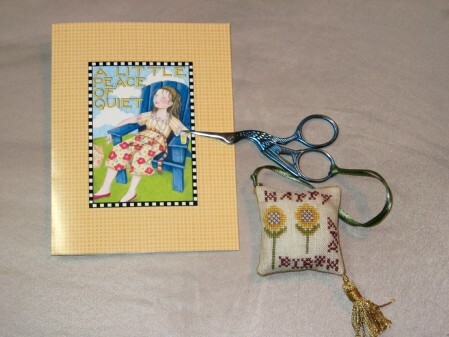 Carol stitched me a fantastic scissor fob and included a lovely pair of scissors. Thanks so much Carol!! Congratulations on your Birthday, nice gift. I completely understand the lack of enthusiasm when trying to complete lots of fractional stitching. I usually only do a little at a time and subsequently it takes me forever to finish a project. Good luck with it! Happy Birthday! What a great present from Carol. Don’t you just love those blue scissors!!? And, your dragon is beautifully stitched. Good job on that! I’ve enjoyed reading your blog so much. Happy Birthday, Leslie! How are you feeling? Happy Birthday to you! Sounds like your husband has taken good care of you! The dragon is looking fantastic and I love the fob from Carol – so pretty! Happy belated birthday! Hope you have many more wonderful ones! belated birthday wishes Leslie, sounds like you had a great time! Carol is such a sweet, sweet lady and her fobs are gorgeous and always individual. Don’t you love those scissors? I have the same set and it’s funny to see the little bird snip off your thread with a nibble. Belated best wishes on your birthday Leslie! Your dragon is lovely.